Thursday evening, the news was coming in fast: normal people were being scared off by wide reporting of Jamie Dimon at JPMorgan stating the obvious about cryptos loudly and publicly, BTC China had just announced it was suspending trading, reports were coming through of this extending to all Chinese exchanges (with announcements from ViaBTC, OKCoin and Huobi), and the price was dropping. 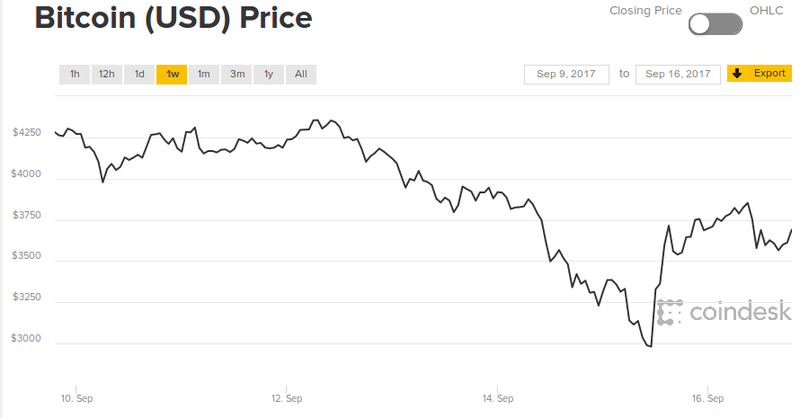 Panicked sellers thought “the bubble has popped, this is gentlemen” and the price dipped below $3000 around 1200 UTC on Friday. The approximate price of a bitcoin for the past week. The truncated Y axis is courtesy CoinDesk, take it up with them. That’s fifty thousand BTC in trades, all of a sudden. This was enough to send the price up to $3600 in four hours. “Bitfinexed” (whose Twitter is well worth following) attributes this to wash trading, where you buy from and sell to yourself to fake trading volume and drive the price up. This happened on an exchange that (per Chapter 8 of the book) hasn’t had banking relations in place for retail customers since late March — it’s been literally impossible to get actual money out of or into Bitfinex for the last six months, except one-off transactions for large customers by arrangement. It turned out Tether had released another 25,000,000 Tethers, each nominally worth one dollar — these being what people use to buy bitcoins on Bitfinex. “Bitfinexed” has been yelling about Tethers for a while now. Tether runs a dollar-substitute blockchain token, the USDT, which is theoretically pegged to the US dollar. The problem is, Tether lost its banking relationships in March 2017 at the same time as Bitfinex — and, in fact, was a co-plaintiff when the Bitfinex companies attempted to sue Wells Fargo in April 2017 for cutting them off — and, since then, has had no visible method of getting US dollars into its claimed reserves backing the USDT. It’s worth noting that despite the front page of the Tether website (archive) proclaiming that these are a stable, fully backed and redeemable US dollar substitute, the legal fine print (archive) specifies that tethers are “not stored value or currency”, you have “no contractual right or other right or legal claim against us to redeem or exchange your Tethers for money” and that they “do not guarantee any right of redemption or exchange of Tethers by us for money.” Tether has called (archive) “Bitfinexed”‘s posts “outlandish conspiracy theories”, but they’re fully cited to Tether’s own words and official legal terms and conditions. Izabella Kaminska at the Financial Times has written up just what she thinks is going on with Bitfinex and tethers, and how they work in a historical context: like Eurodollars, a similar sort of dollar substitute used to trade without going via the US. Everything was fine, fine with Eurodollars until the 2008 financial crisis, when it turned out a lot of them weren’t covered, and the US actually had to bail the issuers out. I suspect the US won’t be doing the same for tethers. Should there be any similar problems. Price in yuan (line) and trade volume (columns), 2013-2017, just in case you thought they bore any relation whatsoever. You can see in January 2017 where the People’s Bank of China made the local exchanges start charging for transactions. Kaminska notes “Bitfinexed”‘s analysis of how the Bitcoin price on Bitfinex has a long history of being manipulated to hell, because you can do things on crypto exchanges that would be flat-out illegal in proper securities. Spoof orders regularly pull the price up or down; the orders disappear after they’ve affected the price, but before they can be executed. A pump had to happen soon. If the price falls too much there will be margin call cascade on Bitfinex, and they don't want that. We eagerly await the long-promised up-to-date audit reports from Bitfinex and Tether, which were due, er, yesterday. 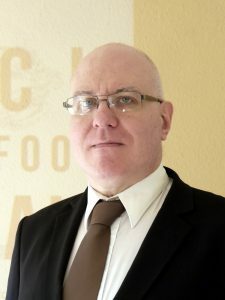 You can make money from cryptos! If you’re good enough to turn a profit in a blatantly manipulated market. 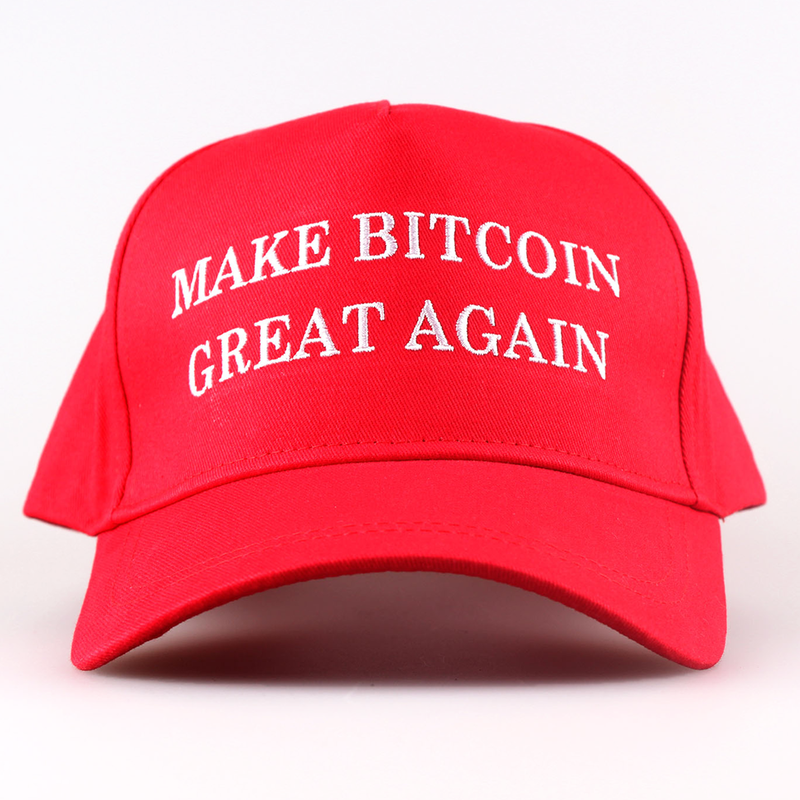 At least BTC China still sell their Official Make Bitcoin Great Again hat. Jamie Dimon is worth listening to: if he says ‘bail out’, you. needed to be out a year ago. 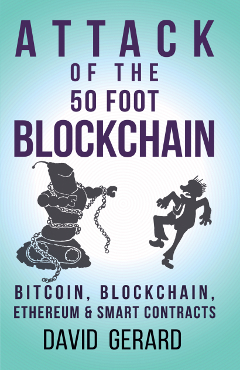 You will be unsurprised to hear that he’s become a sort of demon figure to bitcoiners.